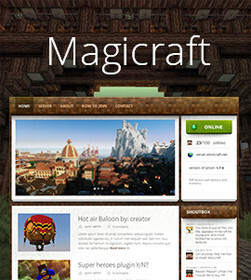 We are proud to announce that Magicraft theme is now Avaible. It gave us some hard times but come on, we are really proud of it now! 😀 If you haven’t checked features go do it now, because I am not gonna talk about it again. We are still going to upgrade it and our next homework is to make new skin, so please tell us if you have any suggestions what material it should be. This main hodor account... ! !